CENTRAL POINT, Oregon, March 19, 2012 (ENS) – Electric vehicle drivers can now cruise along the southern Oregon stretch of Interstate 5 without range anxiety. Officials from the Oregon Department of Transportation, along with charging station partner AeroVironment and the Oregon Department of Energy, opened the first phase of the West Coast Electric Highway in a ceremony on Friday. When complete, the highway will stretch along Interstate 5 from the Canadian to Mexican borders. Spaced roughly 25 miles apart along the southern Oregon I-5 corridor, eight charging station hubs were fired up in Cottage Grove, Rice Hill, Roseburg, Canyonville, Wolf Creek, Grants Pass, Central Point and Ashland. Each location has two charging stations – one DC fast charger that can juice a battery up to full charge in 30 minutes – and one Level 2 medium-speed charger, which will take from four to six hours for a full charge and cost less for users. The new EV charging stations were paid for by $915,000 in American Recovery and Reinvestment Act funding through the Oregon Department of Energy’s State Energy Program. 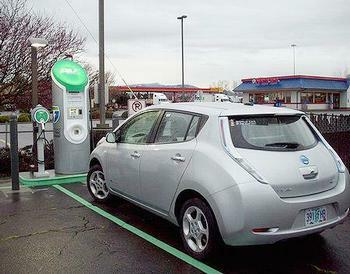 “As the first state in the nation to establish an EV charging infrastructure along a major interstate, Oregon is leading the EV pathway and supporting adoption of the next phase in the evolution of transportation,” said Pat Egan, chair of the Oregon Transportation Commission and vice president of customer and community affairs for Pacific Power. Two more stations, located along I-5 north of Cottage Grove, will join the network later this spring, completing the first phase of the West Coast Electric Highway project. “Once Oregon’s segment of the West Coast Electric Highway is completed, EV drivers will be able to travel from Ashland to Portland at a fraction of the cost of filling a gas tank and with no direct emissions,” Egan said. In the next phase of the West Coast Electric Highway project, AeroVironment will install 24 chargers in Oregon by the end of the year, along with another nine in Washington. The $4 million cost of that phase will be covered with support from Oregon and Washington states and a federal fund administered by the U.S. Department of Transportation. The West Coast Electric Highway will eventually allow EV drivers to travel from San Diego, California to Vancouver, British Columbia, Canada without relying on petroleum fuel. Electric vehicle drivers will be able to activate access to the charging stations by signing up for the AeroVironment Charging Network at www.evsolutions.com/avnetwork or by calling toll-free at 888-833-2148. Once enrolled, EV drivers will receive an AeroVironment Network key fob that will allow access to all AeroVironment chargers along the West Coast Electric Highway. For a limited time, AeroVironment is offering charging for free, giving EV drivers the freedom and convenience of the open road. To the north, the Washington State Department of Transportation selected the city of Bellingham as the first location to break ground on the state’s segment of the Electric Highway based on the city’s commitment to a sustainable future. Within six months, drivers will have the ability to charge their electric cars at charge stations along Washington’s electric highways, I-5 and US 2. AeroVironment will manufacture, install, operate, and maintain nine fast charging stations at retail locations such as shopping malls, gas stations and travel centers with easy access to the highways.